There’s no question who the main guy is in net for the Toronto Maple Leafs: it’s Frederik Andersen. That’s a statement that has taken a long time to be a reality in Toronto, struggling with multiple starters and below average goaltending for a long time. The wait is over, and the every-day starter is here. But should he really be starting nearly every day? Recently, Leafs starting goaltender Frederik Andersen missed a game dealing with a minor knee injury. This leads to a very important discussion on how best to manage his starts going forward. For Frederik Andersen, we know how good he has been as a Maple Leaf thus far. The issue is not the quality of his play. The issue is, or at least the issue could be, his play time. If you take the two individual seasons prior to this one, and rank each goalie’s season by the number of minutes they played, Andersen’s two seasons finish 4th and 6th. Additionally, if you look at his workload as Jim Corsi would track it, by shot attempts faced, Andersen is also ranks 2nd and 4th in the NHL in total shot attempts faced for those individual seasons. It’s not incredibly obvious that something is wrong here, so there’s not a strong conclusion we can draw from this. Andersen’s cold Octobers definitely show themselves in these two charts. And there is a notable dip in performance in the January, February and March parts of the seasons. But both times the numbers creep back up in April. Well, in March of 2017, he had one stretch of 4 days off, and two stretches of 2 days off, that could have contributed to a strong April. In 2018, he had one stretch of 3 days off and one stretch of 5 days off, so again this could be contributing to his bounce back in April. What about the playoffs? Well unfortunately there’s not much to draw from there either. You can see that his playoff performances have generally been poor in Toronto, but no poorer than they were when he was sharing the starting job in Anaheim with Jonas Hiller and John Gibson. There’s not much to say that workload has affected his playoff performance. Besides their play tailing off, the other major concern with regards to workload is the potential for injury. Frederik Andersen is 29, and including the minor knee injury this year, has faced an injury every year since joining the Maple Leafs. 2016, and 2017. Ignoring Frederik Andersen in particular for a moment, there’s another factor at play here, which is that it seems that teams with goalies with lighter workloads tend to win the Cup, as per this piece from Zeke at The Hockey Writers. This histogram clearly suggests that if they want to win the Cup, having their starting goaltender play between 41 and 60 games is the right move. Sparks was really good in the recent Andersen absence, stopping 33 of 34 shots for a 97.1% save percentage. His career with the big club has been rocky, to say the least. His 2015-16 extended stint saw a very strong start (including the emotional career debut shutout), which obviously fell off as the games went on. The cause of this could be any combination of injury, fatigue, inexperience, or lack of talent, though given his AHL results it makes sense to lean towards the former three rather than the latter. However, at the end, we see the effect of his last game, raising his rolling average by almost an entire percentage point. The critical question is whether the Leafs feel that they can trust Sparks enough to reduce Andersen’s workload, but not so much that they feel he threatens Andersen’s job. It seems that from their attraction to a goalie like Curtis McElhinney, the Leafs have an appreciation for the defined backup role, rather than the 1A/1B situations the Leafs have been plagued with in recent years. In Sparks, they have a young goaltender who wants to play, but has struggled enough that it’s worth worrying about putting him for more games. Certainly they don’t have a 1A/1B situation, and giving Sparks 20-25 games shouldn’t suggest that to anyone, including Andersen and the Leafs. While Sparks hasn’t exactly solidified himself as an NHL goaltender yet, it seems like it would be a good idea to start doing so by giving him a bigger share of the games. These starts could come against the weaker opponents to give Andersen fewer minutes with less risk to points in the standings, or they could be against higher shot volume opponents to give Andersen fewer shots faced, or it could be a bit of both. Realistically, this team is good enough that it can afford a few lower save percentage performances and still get into the playoffs. 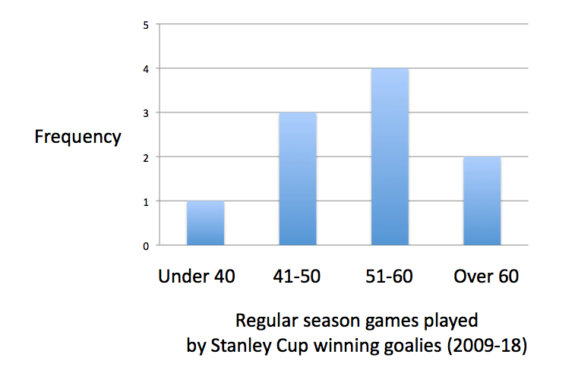 Either way, the Leafs can stand to gain in the long term by taking a little bit of risk in the short term. With the savvy management group this team has put together, I don’t see why this couldn’t happen. How many games should Andersen start? Is resting him more a good idea? Let me know what you think in the comments! At points it seems like he is better while playing more minutes. Nights when he has 30+ shots he seems to play much better ex. last night.